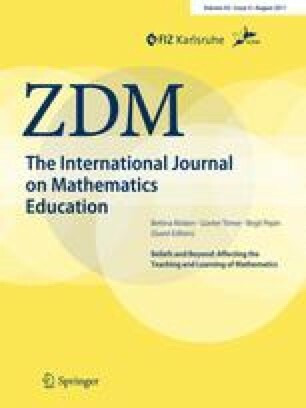 Beliefs influencing students’ mathematical learning and problem solving are structured and intertwined with larger affective and cognitive structures. This theoretical article explores a psychological concept we term an engagement structure, with which beliefs are intertwined. Engagement structures are idealized, hypothetical constructs, analogous in many ways to cognitive structures. They describe complex “in the moment” affective and social interactions as students work on conceptually challenging mathematics. We present engagement structures in a self-contained way, paying special attention to their theoretical justification and relation to other constructs. We suggest how beliefs are characteristically woven into their fabric and influence their activation. The research is based on continuing studies of middle school students in inner-city classrooms in the USA. The authors thank Robert Capraro, Mary Margaret Capraro, and Nicole Shechtman for stimulating discussions. This research was partly supported by the US National Science Foundation (NSF), Grants 0138806, ESI-0333753, and REESE-1008770. Any opinions, findings, conclusions, or recommendations are the authors’ and do not necessarily reflect the views of the NSF.